AND THEY AREN’T DONE YET! In campaign finance reports submitted today, it’s reported that Save Our AZ Solar spent $667,082.04 with the hopes of getting Bob Burns re-elected to the Corporation Commission. When you dive a little deeper into the numbers you’ll see that Save Our AZ Solar received $700,000 from SolarCity. And ALL of this spending took place over a 16 day period – August 2 – August 18. You can review the finance report here. In Burn’s campaign rhetoric he speaks often about “special interests” trying to stack the deck at the Corporation Commission. This infusion of cash from SolarCity in support of Burns is starting to make us believers. 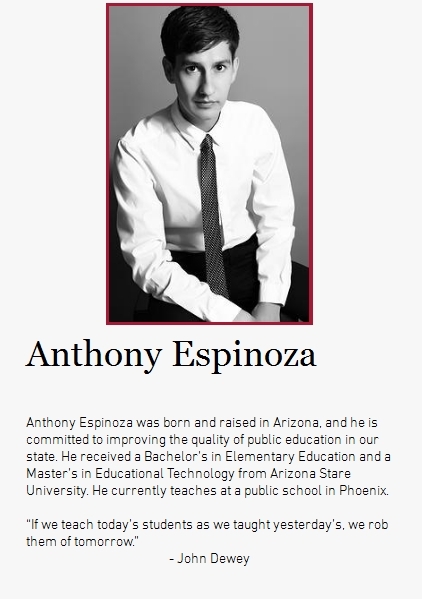 Unlike Arizona Republic’s EJ Montoni, Arizona Liberal Watch has “done their homework” on the man behind the ‘RECALL DOUGLAS’ campaign. Get your bag of popcorn ready and then click here to read the entire piece. State Representative Paul Smith filed the following complaint with the Arizona Secretary of State’s Office along with the Citizens Clean Election Commission regarding illegal campaign coordination between the Scott Smith campaign, Better Leaders for Arizona and Randy Redd. In the complaint, Boyer alleges that Smith’s campaign and the independent expenditure committee illegally coordinated an attack against Doug Ducey using ads. The complaint states that Smith’s committee and Better Leaders for Arizona violated Arizona Revised Statute § 16-911. In late July, 2014, Better Leaders for Arizona, an independent expenditure committee making expenditures in the Arizona governor’s race, released on its website a video advertisement featuring Randy Redd. Mr. Redd is a failed Cold Stone Creamery franchisee. The advertisement included commentary from Mr. Redd complaining about his failed experience as a Cold Stone Creamery franchisee. Mr. Redd blames his business failure on gubernatorial candidate Doug Ducey. On August 1, 2014, the Smith for Governor Campaign issued a press release featuring Mr. Redd. The press release tracks the same talking points that Mr. Redd used in his advertisement with Better Leaders. 1. Any officer, member, employee or agent of the political committee making the expenditure is also an officer, member, employee or agent of the committee of the candidate whose election or whose opponent’s defeat is being advocated by the expenditure or an agent of the candidate whose election or whose opponent’s defeat is being advocated by the expenditure. 2. There is any arrangement, coordination or direction with respect to the expenditure between the candidate or the candidate’s agent and the person making the expenditure, including any officer, director, employee or agent of that person. 4. The expenditure is based on information about the candidate’s plans, projects or needs, or those of the candidate’s campaign committee, provided to the expending person by the candidate or by the candidate’s agents or any officer, member or employee of the candidate’s campaign committee with a view toward having the expenditure made. The facts illustrate several reasons for your agency to open an investigation to see whether the Better Leaders video and Smith press release are not “independent” of one another. Both communications featured the same person, Mr. Redd, who complained about his failed Cold Stone franchise. In both communications, Mr. Redd follows the same basic script. In both communications, Mr. Redd blames Doug Ducey for his personal business failure. Both communications were released close together in time. Applying the facts to the law also justifies an investigation. By providing services to both committees, Mr. Redd may be acting as a member, employee, or agent of both by supplying them with similar information about his experience. He may be directing information on what content about his failures that each committee should include in the ad, based on the “plans, projects or needs” of Smith’s campaign. It is reasonable to believe that the Smith campaign helped direct the Better Leaders expenditure through Mr. Redd and a pass-through, by requesting that they post the video a few weeks prior to Smith issuing his press release. It is also reasonable to believe that the Smith campaign worked directly with Better Leaders to coordinate this “double punch,” with Better Leaders’ video followed by an aggressive press release and media campaign by Smith. In conclusion, I ask that your agencies open an investigation into Better Leaders, Smith, and Mr. Redd based on the apparent lack of “independence” between the video and press release. The contents of this letter are based on my personal knowledge. I declare under penalty of perjury that the foregoing is true and correct. 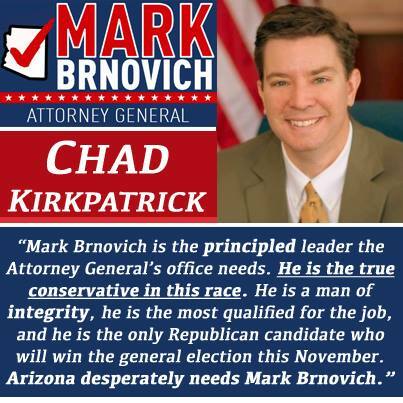 Today, Republican candidate for Attorney General Mark Brnovich announced the endorsement of conservative Arizona leader Chad Kirkpatrick. Kirkpatrick is the former Chief Information Officer for the State of Arizona, former Chairman of the Arizona Federation of Taxpayers, and an original founder of the PAChyderm Coalition. “Mark Brnovich is the principled leader the Attorney General’s office needs,” said Kirkpatrick. There’s no question national Democrats are worried they are losing to Republican Andy Tobin. Nancy Pelosi’s Super PAC, named House Majority PAC, is on defense and has launched a broadcast television buy in Arizona to prop up Ann Kirkpatrick’s faltering public image and highlight Tobin’s opposition to ObamaCare. Tobin has fought for your family’s freedoms, your prosperity and your community for the past six years while serving in the Arizona Legislature. 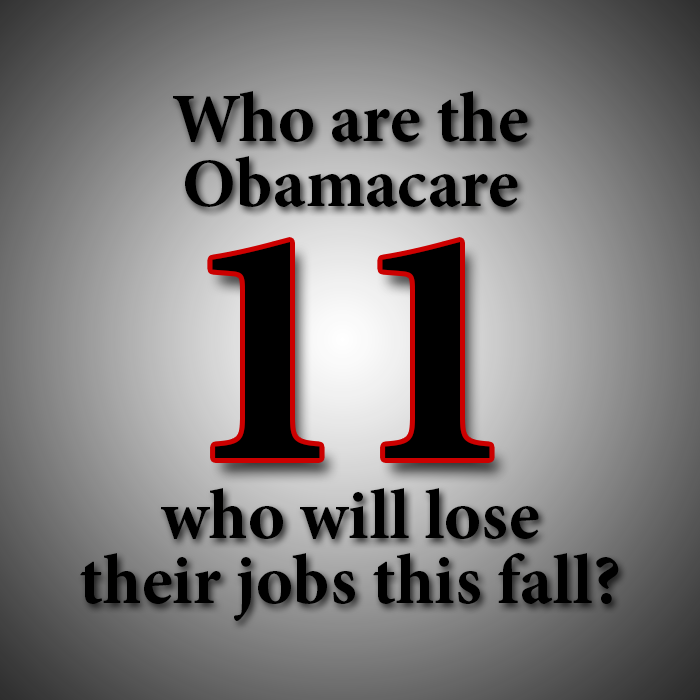 He continues to lead the fight to stop the implementation of the disastrous ObamaCare. As your Representative in Congress, Andy Tobin will represent your voice, and lead the charge in fighting for you against the wasteful spending, government intrusion, and out-of-touch insiders that are taking away your freedoms. Angry with Arizona legislators who voted for the Obamacare Medicaid expansion in 2013? So is the independent expenditure committee, Arizona Taxpayers Action Committee. Recently, the Arizona PAC began targeting Republicans who went along with the key provision of Obamacare that now inflicts Arizona. Last month, the group began calling Republican voters in legislative district 15 where Republican Representative Heather Carter was elected. Carter who sponsored the bill on behalf of Governor Brewer was unashamedly supportive of Obamacare Medicaid and made every effort to push for the expansion during the 2013 session. Arizona Taxpayers Action Committee called into the district warning voters of Carter’s vote spurring a movement to toss Carter this year. Behind the scenes, the group is asking voters not to sign her petitions nor finance her campaign. Saturday, ATAC began making calls in another district, this time in the far east valley’s legislative district 16 where it has its target set on state representative, Doug Coleman. Calls are also warning voters that Coleman voted for Obama’s expansion into Arizona. Precinct committeemen are being asked to not carry Coleman’s petitions. This strategy will also take place in other districts where Obamacare-supporting Republicans reside. Earlier this week, ATAC released its 2014 Primary list which includes house and senate members running for re-election with primary challengers. ATAC’s efforts will certainly cost money to run calls and send mailers into each of the targeted districts and it won’t be easy as all of the Obamacare-supporting Republicans have seen their coffers filled by the healthcare industrial complex on behalf of Governor Brewer. Anyone researching the flow of campaign money sees tens of thousands of dollars being given to those Republicans who supported Governor Brewer. And while ATAC sees itself as a David in a battle against Goliath, the PAC which has been around since 2006 and even won a US Supreme Court case, sees 2014 as an opportunity to send a message that Arizona lawmakers are bound to serve taxpayers and not corporate interests. ATAC is currently accepting donations through its website at ArizonaTaxpayerAction.com or via its donation portal. Tea Party Patriots Joins URAPC to stop Brewers Surrender of Arizona to Obamacare. The Tea Party Patriots join the Alliance! The United Republican Alliance of Principled Conservatives is proud to announce the Tea Party Patriots have joined our effort to fight the Obamacare Medicaid Expansion in Arizona. The Alliance has captured the attention of the nation with the herculean effort of the grassroots army to defeat Governor Brewer’s ill conceived and unconstitutional legislation so it can be referred to the ballot and vetoed by the people. You can join URAPC and the Tea Party Patriots in this historic effort to defeat Governor Brewer’s Obamcare Medicaid Expansion by signing a petition or making a donation. Join the Alliance at URAPC.ORG for updates and to receive information. Contact Christine Bauserman, Frank Antenori, or Ron Gould at info@urapc.org or 520-235-2234. The United Republican Alliance of Principled Conservatives released the results of a statewide survey conducted last week that shows immense support for the referendum on the ObamaCare Medicaid Expansion. The statewide survey shows that 69% to 70% of respondents continue to reject Governor Brewer’s plan to implement the ObamaCare Medicaid Expansion in Arizona. Do you believe that the voters should have the opportunity to vote on the Obamacare / Medicaid Expansion in the 2014 election? Do you agree that Congress and their employees should be on the same plan as taxpayers? The Governors attempt to ignore the facts that Proposition 204 was a vote on how to spend the tobacco fund and a population increase to 100% versus her 2013 Medicaid Expansion bill that is funded by new taxes and increases the population to 133% is rejected by a consistent 69% to 70% of those surveyed. The survey was conducted from August 19-21, 2013 with on online survey and 541 respondents. The heavily Republican response shows that 72% oppose ObamaCare, 69% reject a tax increase to pay for it, and 70% reject a repeat of the 2010 cuts to education, roads, or public safety. The numbers reveal a steady pattern consistent with the poll conducted in April of this year by Magellan Strategies, proving once again that Arizona voters reject participation in ObamaCare including the Medicaid Expansion. URAPC presents the survey as evidence that the referendum will experience the same resounding victory that occurred with the overwhelming passage of Proposition 106 in 2010. The survey clearly shows the Governors attempt to ignore the copious differences between her 2013 Medicaid Expansion and the 13-year old Proposition 204 is rejected by the majority of Arizona voters. the Precinct Committeemen, Small Businessmen, and Hard Working Taxpayers that have taken up pen and clipboard to thwart the alliance of Corporate welfare recipients, greedy lobbyists, and rogue Republican legislators. URAPC grows as those committed to having their voices heard by collecting the required signatures to send this critical decision to the voters. In 1776 the British monarchy hired the Hessian mercenaries to terrorize the colonists in the New World. Ideas like “freedom” and “representation” were considered extreme and radical. Today in Arizona we face a Governor willing to bypass the checks and balances put in place by our Founding Fathers. A Governor who purposely uses special privileges as a weapon against elected legislators. A Governor who is willing to subvert the spirit of the constitution, call a special session and suspend the rules just to force the largest socialistic takeover in U.S. history – the Obamacare/Medicaid Expansion – upon the people she was elected to serve. She trampled on our rights. She took away our right to fair representation. The end result of her actions will eventually lead to the full implementation of Obamacare which will force Arizonans to buy taxed tea ..oops.. I mean Federal health insurance. Our Government is trampling on our freedoms at the National and State level. They cannot win on the issues. They cannot get a bill passed without suspending the rules, and threatening to remove the President and Speaker. Now they are “aggressively” misleading a.k.a. lying to people to stop us from gathering signatures. In spite of a well funded $150,000 campaign to stop the gathering of signatures the Alliance of volunteer Republican Principled Conservatives grows. URAPC is committed to maintaining the deep individualist spirit of Arizona and restoring freedom from an obtrusive government by leading the way to Veto Governor Brewer’s Medicaid Expansion. Join us today and fill out a petition today!